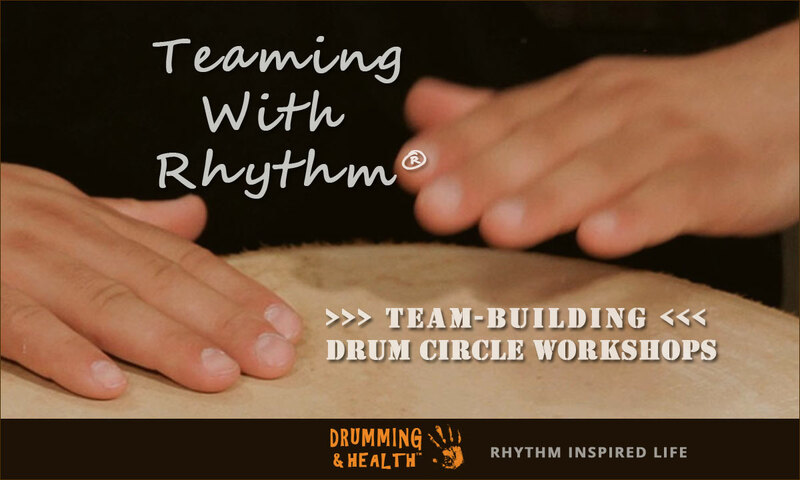 "The most successful companies actively invest in and inspire their people"
Teaming With Rhythm is dynamic team-building drum circle workshop sessions that combine drumming and experiential exercises to grow cooperation and rapport among your team members. Then your team takes your organization from great to extraordinary! Get your team working better together. Each team member gets to play a drum plus a wide assortment of percussion instruments from around the world. Sessions are super-fun, beginner-friendly, interactive, moderately physical, and can focus on a particular theme. After learning basic drum sounds, we create a strong rhythmical foundation upon which we can build. 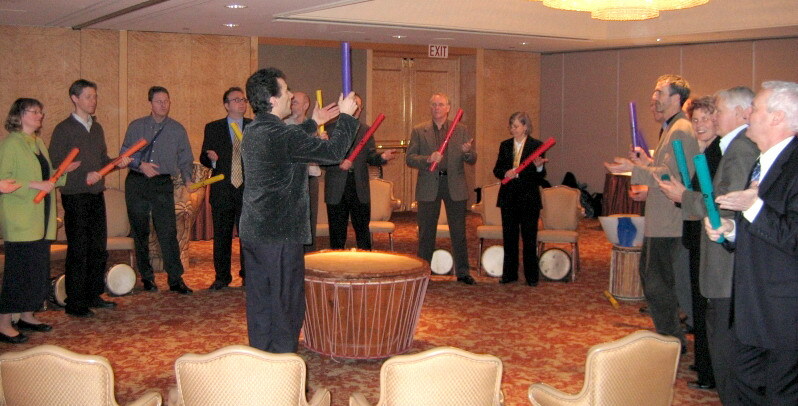 This rhythm orchestra is a metaphor for how your company runs its business. When your staff experience playing music as a group, together they will work better on the job. Add on our exclusive Identity Booster Process to turbocharge your team and enhance long term positive team outcomes. Add on Values and Vision to tighten individual connection and commitment to your organization's guiding principles and direction. Add on Celebrating The Wins, a unique customized energizing process to ensure essential appreciation and recognition is delivered effectively to individuals and teams to encourage maximum engagement and future performance. Your facilitator Lyle Povah has over 30 years experience and specializes in helping your team members access their natural power and initiative. B﻿etter performance, reduced costs, and greater success achieving or exceeding goals comes when organizations focus on improving their team dynamics and investing in their staff. A drum circle was the perfect exercise for bringing our team closer together. 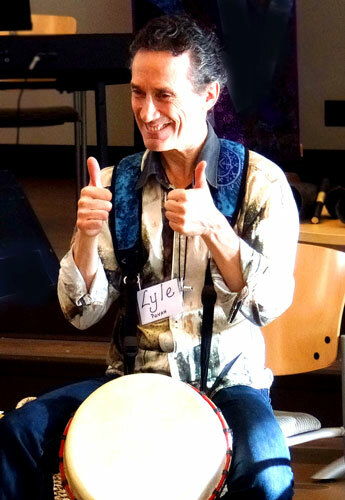 I highly recommend Lyle – he brought the right amount of thoughtfulness, energy and humour to the group. He is a fantastic facilitator! 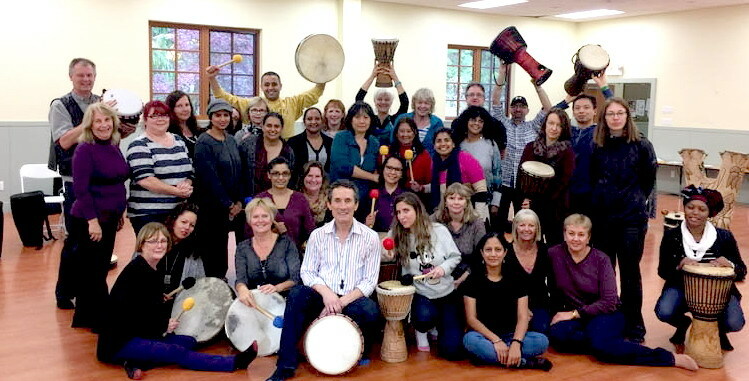 Team-Building Drum Circle Workshops enhance the sense of community and connectedness between individuals and groups within your organization. Christine Lithgow, President and CEO, Aon Reed Stenhouse Inc. "A-MA-ZING!! Thank you for awakening my primal beat" Participant, "Meeting the Leadership Challenge", UBC Sauder School of Business"
"Excellent performance and great session - keep it up!" Mohammed Bawa, Chief Whip, Nigeria House of Representatives, Nigeria National Assembly. "I found the experience very energizing and invigorating... the best team activity I've participated in... I got to see sides of some people I never imagined." Vivian Cheng, Family Counsellor, Westcoast Family Centres Society. This is THE place for Team Building Workshops Vancouver!